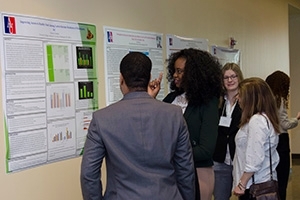 On April 2, College of Arts and Sciences undergraduate, graduate, and doctoral students presented their original scholarly and creative works at the 26th Annual Robyn Rafferty Mathias Student Research Conference. This year’s program was particularly poignant because Robyn Rafferty Mathias passed away several days before this year’s conference. Mathias, an AU alumna and trustee, generously supported faculty and student research in the College of Arts and Sciences, including the annual conference, which was named in her honor. “Robyn never missed this research conference, and sat in on each session and spoke with each student who presented a poster. She was an active and engaged participant, absorbed in the work of our students and faculty. Furthermore, she was a lovely, gracious, and generous woman, and our students and university are forever in her debt,” says Peter Starr, dean of the College of Arts and Sciences.